Thank you for your purchase! We cannot express how grateful we are that you have put your faith and trust in our dedicated company to deliver to you a quality product at an affordable price. Your support helps us keep doing what we are passionate about; putting affordable automated plasma cutting technology into the skilled hands of fabricators, artists, and makers across the globe so that they may bring their ideas to life. For many of our customers, the CrossFire is their first exposure to both plasma cutting and CNC machinery. We want to re-assure you that we stand behind you and want to do everything we can to make your use of this product as rewarding as it possibly can be. We want you to know that we are always an email or phone call away. We also have an online forum accessible from our website where you can connect with other owner’s to get your questions answered. We know we have done our job well when customers tell us that they can’t believe how such an affordable tool can work so well and be so easy to use; especially when they need it most! We love hearing from our customers about what they are building with the CrossFire. If you have a cool project that you are proud of, please tell us about it! We love to showcase the amazing work of our customers on our website and social media. Furthermore, we encourage you to share your non-proprietary designs and cutting files with the online community on our website so that others may have the chance to experience your idea come to life on their own machine. Once again, thank you for putting your faith in Langmuir Systems. We wish you many years of reliable cutting. When used correctly, the Langmuir Systems Crossfire CNC Plasma Table will offer you years of safe operation. However, like all other automated and industrial type machinery, there are important safety considerations and precautions that must be followed in order to avoid injury. Study these safety warnings carefully before assembling and using your machine. Never touch bare wires/buses/connections or components that are carrying electricity. Repair or replace all worn or damaged components. Turn off power to machine and plasma cutter when making repairs. If you have limited electrical knowledge/experience, hire a certified electrician to perform all electrical work. Never operate the machine in the vicinity of flammable materials or where there is volatile and combustible fumes in the air. Do not use the machine to cut materials or parts that have previously contained fuel or flammable substance of any kind such as gas tanks. Always keep a fire extinguisher nearby in case of emergency. Never operate the machine in a poorly ventilated area. Acquire sufficient training before operating the machine. Never place any part of your body in direct contact with areas of the machine that can pinch and crush when powered on. Assume that if the machine is powered, it may move at any time. Keep area clear of bystanders, make sure that no one but the person operating the machine has access to the computer controls. Keep all fumes and gases from the area in which you breathe. Never operate the machine in an area with minimal or no ventilation. Use fans and blowers to remove fumes and gases from the work area. If ventilation is poor, use an air-supplied respirator system. The type of fumes and hazard level depends greatly on the type of metal being cut. Before cutting, consult the Material Data Safety Sheet (MSDS) for specific guidelines on the type and hazard level of the fumes produced during cutting. Never cut materials that has been coated with paint, oil, grease, or solvents. Never operate the machine without sufficient eye protection. Consult the user manual for your plasma cutter to determine the minimum protective shade required for the amperage of your machine. Alternatively, consult ANSI/ASC Z49.1. Wear gloves and suitable clothing to protect your skin at all times. Always alert bystanders before you begin cutting. Bystanders in the immediate vicinity must wear suitable eye and skin protection. Use welding screens whenever possible. Always wear suitable eye protection when operating the machine. Eye protection should follow the guidelines established in ANSI Z87.1. Ensure that all bystanders in the immediate vicinity are wearing suitable eye protection. Do not touch any part of the machine when it is moving under power. Be aware of all areas of the machine that could potentially be a pinching hazard, such as bearings, lead screws, lead nuts, and slides. Never make repairs to the machine when the machine is powered on. Always assume that metal resting on the machine is hot enough to cause severe burns. Always allow the metal to sufficiently cool before handling. Use a bucket of water to cool down part before handling with bare hands. Never handle hot metal with bare hands. Use gloves or tongs to remove material from the machine. The Langmuir Systems CrossFire comes to you only partially assembled. Therefore, this section serves to provide all of the pertinent information and instructions needed to fully assemble your new machine. Unbox the CrossFire Machine with an overview of the parts you've received. Assemble the tubular steel frame of the CrossFire. Install the upper rail tube and the gantry with stanchion plates. Install the slat holders and slats if you are not going to install the water table. If you plan on installing the water table, you can skip this step and follow the Water Table Assembly instead. Install the X and Y-axis Stepper Motors and Lead Screws. Install the Torch Mount, Tube Caps, Cable Support Tube, Torch Height Stand-off Shims, and T-Handle Hex Key. Secure the lead nuts after aligning the machine. TIP: Before operating your machine, it is important to oil your lead screws to reduce friction as much as possible. We recommend using either multipurpose oil or motor oil. Place a few dabs of oil along the length of the lead screws and cycle the gantry and torch to fully coat. Install the electronics enclosure and connect the stepper motors. The CrossFire was designed to be compatible with plasma cutters that are equipped with a hand torch or machine torch. A hand torch enables the operator to start and stop the cutting action by squeezing and releasing the torch trigger. This section contains the instructions for a hand torch. When installed on the CrossFire, the electronics system must have control over when the torch turns on and off. Providing this control requires splicing into the wires that connect to the trigger so that the CrossFire’s onboard relay can fire the torch when commanded to do so by the CPU. The purpose of this section to provide the general procedure required to make the wire splices inside of your plasma cutter to facilitate mechanized cutting on the CrossFire. The procedure was designed to be as easy and minimally invasive as possible while preserving your plasma cutter’s ability to be used for hand cutting when not used on the CrossFire. Since there are dozens of plasma cutters on the market, the procedure is intentionally general so that it may be applied to any compatible plasma cutter you select. 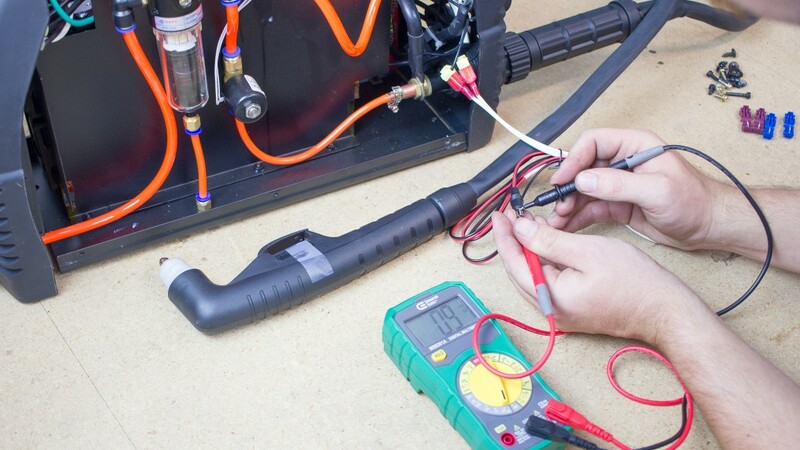 Splicing into the torch trigger wires may or may not violate your plasma cutter’s warranty. It is your responsibility to check with your plasma cutter manufacturer regarding the terms of the warranty and whether or not executing the splicing procedure violates those terms. Langmuir Systems will not be held responsible for warranty violations. 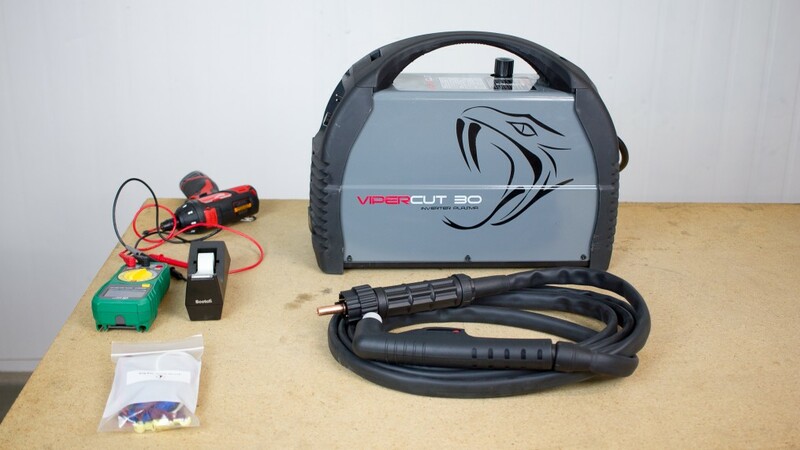 Completing the procedure requires opening up the cabinet of your plasma cutter power supply which will expose you to high voltage and high amperage electrical components. It is your responsibility to make sure that all work is done safely and with the power disconnected. If you have any doubts regarding your ability to safely perform this work, we strongly urge you to solicit the services of a professional electrician. Langmuir Systems will not be held responsible for any injury or death resulting from the incorrect or unsafe execution of this procedure. 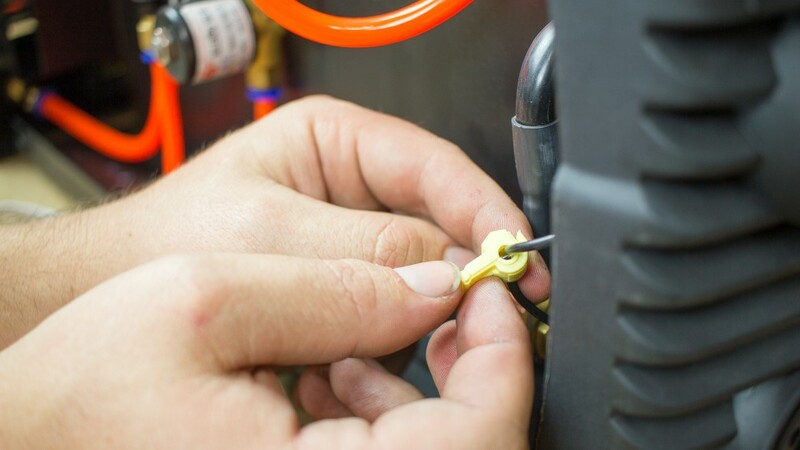 After the wire splices are made, it is critical to never leave the torch firing cable connected to the CrossFire electronic enclosure when the torch is not installed in the torch mount and ready to cut. If the torch is required for hand cutting duty, it is imperative to first disconnect the torch firing cable before removing the torch. Failure to do so creates the opportunity for the CrossFire electronic system to turn the torch on when the torch is physically in an unsafe location; such as in the presence of volatile or explosive substances. Failure to disconnect the torch firing cable from the electronic enclosure when the torch is not installed can cause serious injury or death. Langmuir Systems will not be held responsible for any injury or death resulting from the lack of adherence to this critical safety requirement. A test light or a multi-meter with continuity measuring capability is required to complete this procedure. Your plasma cutter may be different than the one shown so you may find that the procedure for your specific plasma cutter may need to differ somewhat. Find Torch wiring hardware (Bag #14) and your plasma cutter. 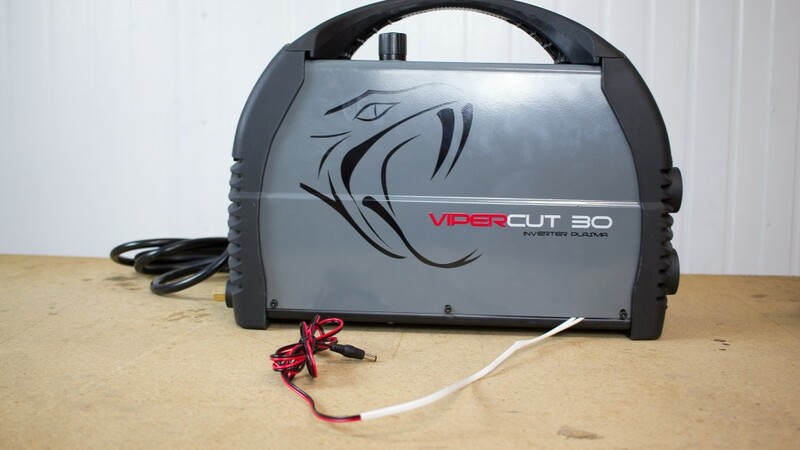 We'll be using the Razorweld Vipercut 30 in this example. 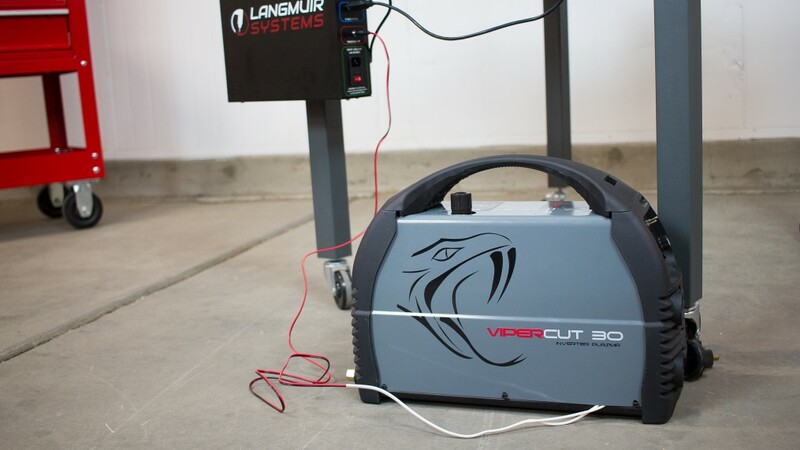 Unplug your plasma cutter and wait for at least 10 minutes before proceeding in order to provide sufficient time for the internal capacitors to discharge. 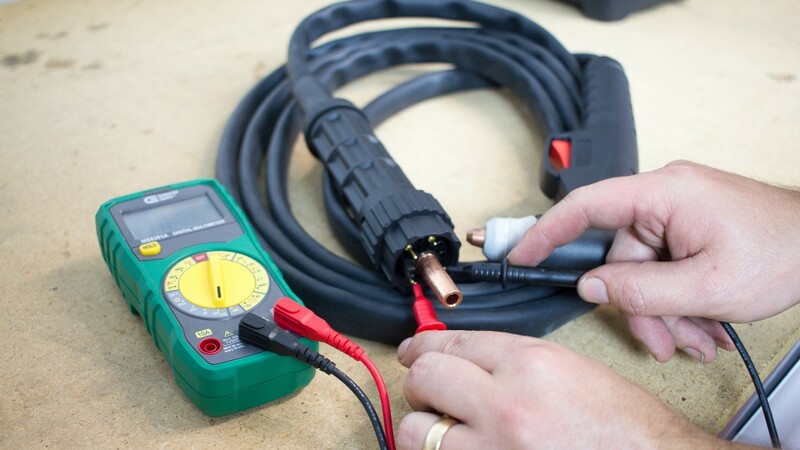 Disconnect the torch hose from the plasma cutter power supply. With the trigger not depressed, use your multimeter to check if there is continuity between any sets of pins. If there is continuity between a set of pins, make note of them. Use a piece of tape to temporarily depress the torch trigger. Again check for continuity between sets of pins with your multimeter. The set of pins that did not have continuity when the trigger was not depressed, but do now, are the trigger wire pins. Make note of their location in the connector. Make note of the location of the trigger wire pin receivers in the female connector on the plasma cutter. Remove the cover of your plasma cutter cabinet. Some plasma cutters will require tools to accomplish this. 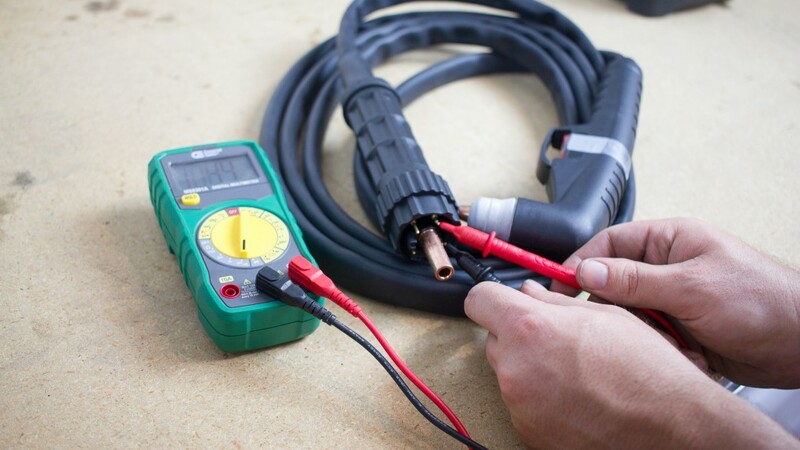 The objective is to gain access to the wires that connect to the torch hose connector mounted to the exterior of your plasma cutter. 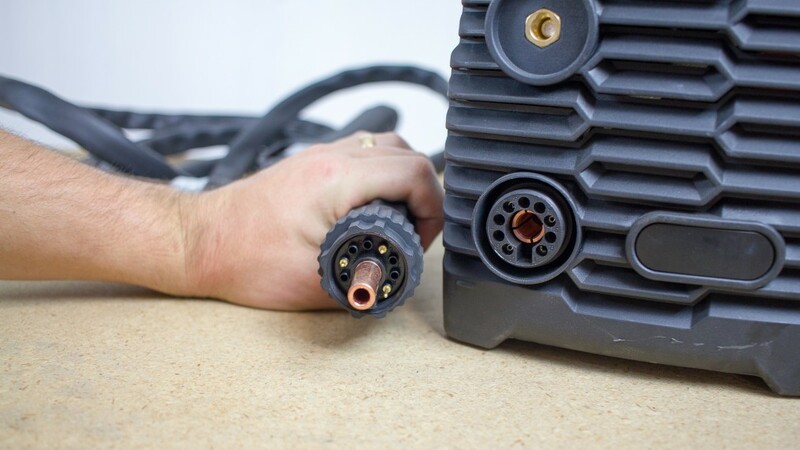 Once open, identify the wires inside of the plasma cutter cabinet that correspond to the trigger wire pin receivers in the female connector. Attach the T-tap connectors to the trigger wires. You may need to use a set of pliers to clamp them onto the wires to ensure that the clasps fully lock. Langmuir Systems provides 3 different sizes of T-taps for different gauge wires. Please use the appropriately sized tap for your wire: Not too wide of a slot so it doesn't cut the wire insulation and not too tight where you can't snap it on. Once snapped into place, work the connector back and forth a few times (half turns) to ensure the insulation is cut and the metal is exposed to the connector. 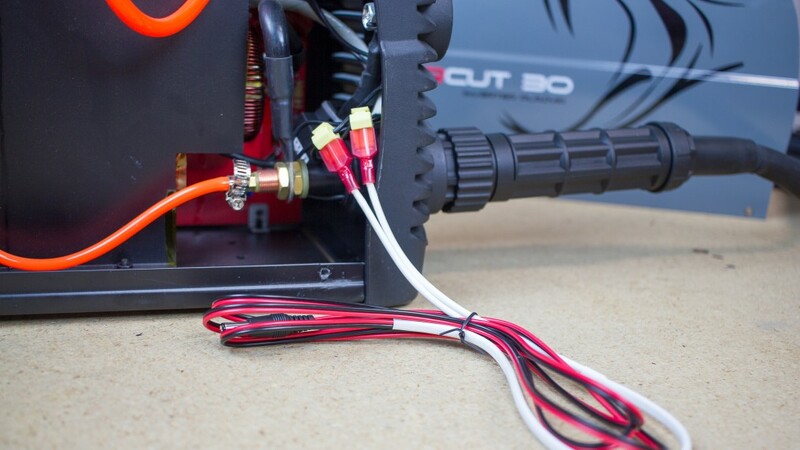 Locate the torch firing cable that was provided with your machine and connect the blade connectors to the T-Tap connectors. It does not matter which blade connector gets plugged into which T-tap connector. The polarity and wire coloring is not important. Plug the torch hose back into the plasma cutter. With the torch trigger depressed, check the continuity between the two bare ends of the torch fire cable. If you spliced into the correct wires, there should be continuity. If not, go back and verify that the correct wires were identified in Step 3. Release the trigger. Verify that there is no longer continuity between the two bare ends of the torch fire cable. Reinstall the cover on the plasma cutter cabinet with the torch fire cable exiting the cabinet in a convenient location. Make sure that there are no sharp edges that could damage the torch fire wire insulation. Add additional abrasion protection as needed. Plug the male end of the torch fire cable into the 'Torch On/Off' jack in the electronics enclosure. As instructed in our cutting tutorials, plug in the plasma cutter with torch installed only when the torch is installed into the Torch Mount for firing safety. Once your machine is fully assembled, continue on to our software tutorials to learn the basics of CAD/CAM and start cutting! 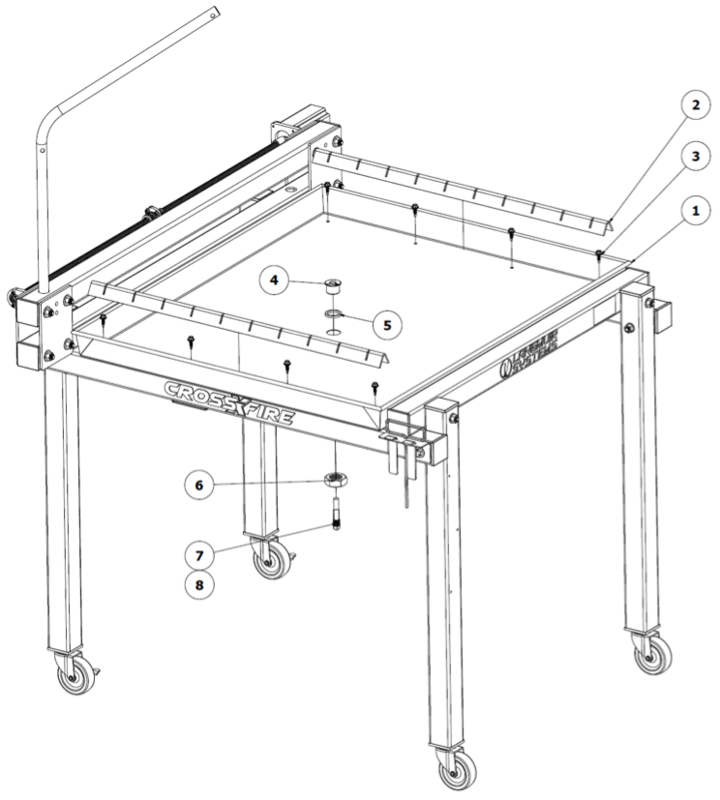 Use these installation instructions to assemble and install your water table. Note: We have transitioned from Aluminum Water Tables to Stainless Steel in order to eliminate possible corrosion. Zinc Anodes are no longer necessary. If you use a rust inhibiting product, you must empty the water table completely after each use. We recommend draining the water into a bucket underneath the table so that it can be reused later. Periodically check your zinc anode and wire brush it as needed to remove any salt formations. If you do not wish to empty the water table after each use, then you must use only water in the water table. Tap water will not corrode the aluminum. However, it will cause the slats to develop a cosmetic layer of surface rust that will not affect their performance. Note: Gantry assembly hidden from view. 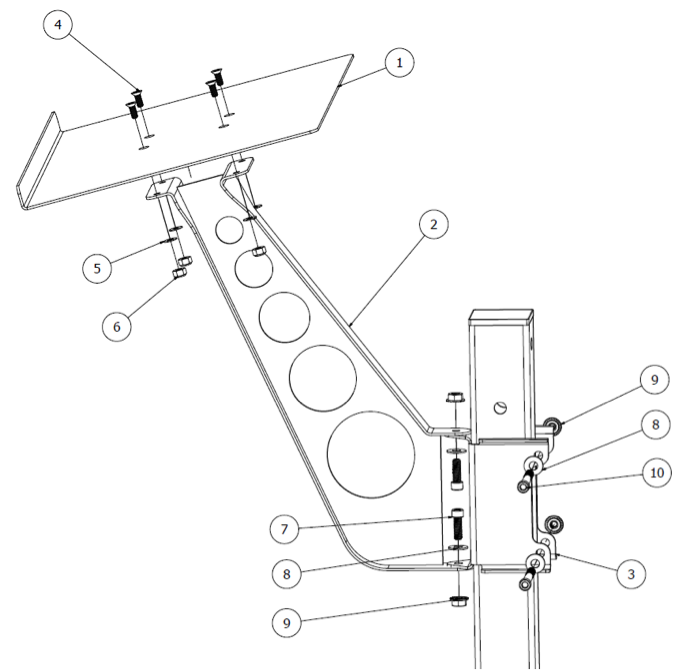 If standard slat holders and brackets are already installed on the CrossFire, remove these items before proceeding with water table installation. Place aluminum water table in position so that it is resting on top of the two ‘CrossFire’ tubes. Visually center the water table between the ‘Langmuir Systems’ square tube and the ‘Lower Rail’ square tube. Also center the water table so that it overhangs the ‘CrossFire’ tubes equally on both sides. Clamp the water table in position with standard C-clamps. Using a screw gun or nut driver, fasten the water table to the ‘CrossFire’ tubes with the included eight Self-Drilling Sealing #10 Screws (#3). These fasteners are self-drilling and will penetrate the ‘CrossFire’ tubes before threading into place. Clear any cutting chips between the rubber seal and water table and water table and the ‘CrossFire’ Tubes. Note: do not overtighten or risk stripping screws and/or tubes. Simply seat the screws enough to compress the Nitrile washer gently. Install the Brass Tank Fitting (#4) into the water table hole with the Nitrile O-ring (#5) positioned as a washer on the underside of the tank fitting flange. From the underside of the water table, fasten the 1”-8 Hex Nut (#6) to the Brass Tank Fitting. Tighten nut. Install the Brass Drain Plug w/Zinc Anode (#7) into the internal threads of the Brass Tank Fitting and tighten. Place the two Slat Holders (#2) inside the water Table so that they are resting in position above each ‘CrossFire’ tube. The 8 sealing fasteners should be covered up completely by the slat holders. Fill water table with a mixture of water and a plasma compatible rust inhibiting solution to the desired level. We recommend filling the water level to ¾” below the top slat surface to prevent excessive splashing during cutting. Place 10 slats into slat holders. 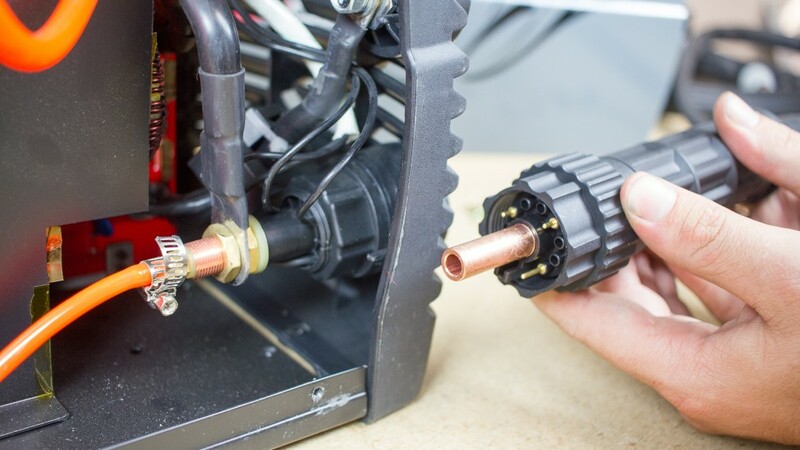 Before cutting, be sure to attach plasma cutter ground clamp to the Brass Drain Plug under the water table. Use these installation instructions to assemble and install your laptop stand. 4x Phillips Flat Head #10-24 x 1/2"
2x Socket Head Cap 1/4"-20 x 3/4"
2x Socket Head Cap 1/4"-20 x 2.5"
Fasten Leg Mounting Bracket (#3) to the front left CrossFire Leg tube using two long Socket Head Cap Screws (#10), two Washers (#8), and two serrated Flange Nuts (#9). Fasten Vertical Support (#2) to Leg Mounting Bracket (#3) using two short socket head cap screws (#7), two Washers (#8), and two Serrated Flange Nuts (#9). Note: The amount of swivel resistance can be adjusted by tightening or loosening fasteners to the desired resistance. Fasten Tray (#1) to Vertical Support (#2) using four Phillips Flat Head Screws (#4), four Washers (#5), and four Nylock Nuts (#6). Warranty benefits only apply to the original purchaser and expire if goods are resold. You must provide proof of purchase and your machine's unique serial number (if applicable) via email before a warranty claim may be filed. The buyer has 7 days after delivery to report and request to receive any missing items. Langmuir Systems will ship the missing items to the buyer within 10 business days. Langmuir Systems has the right to refuse replacement of items to any buyer that it suspects may not be truthful. The buyer is responsible for the replacement of any missing items after the 7 day period expires. Items that are received in defective and unusable condition. Items that become defective and unusable after use as a result of a manufacturing, design, or material defect. Defects that do not negatively affect the items functionality. Examples may include scratches, dings, dents, and surface abrasions. Defects that are caused by improper assembly. Defects that are caused by improper use. Defects that are caused by inadequate or incorrect routine maintenance. Defects that are caused by improper storage of the item or exposure of the item to the elements. Defects that are caused by normal wear and tear. If a damaged or defective item is covered by the warranty, Langmuir Systems reserves the right to request that the defective item be shipped back before supplying a replacement. Langmuir Systems will supply a shipping label to cover the expense of the return shipment. The Buyer is responsible for handling and packaging. Langmuir Systems will ship either a refurbished or brand new replacement item within 5 business days of receiving the defective item. Only the original buyer of the item is eligible to return the item for a refund. Proof of purchase is required in order to be eligible for a refund. A return must be requested within 30 calendar days following the delivery of the item. Return requests after the eligibility period will be denied. The buyer is responsible for all shipping and handling costs associated with shipping the item back. The item must be in unused condition. The item must be free of defects. The item must be received in the original packaging. Langmuir Systems will inspect the item within 5 business days of receiving it. The buyer will be informed if it passes inspection and thus is eligible for a refund. If Langmuir Systems concludes that the item meets the refund eligibility requirements, a refund for the original transaction amount minus a 20% restocking fee will be issued to the Buyer within 5 business days following the completion of the inspection. 'In person' returns require permission from Langmuir Systems in advance.